Threki the Innocent is a Nord thief imprisoned in Riften Jail. She wears only a roughspun tunic and a pair of footwraps. She is one of three prisoners initially held in the Riften Jail; the two others are Molgrom Twice-Killed and Sibbi Black-Briar. 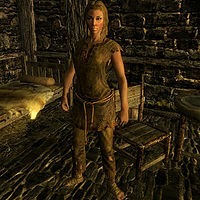 If spoken to, she claims she is innocent and blames the corrupt nature of the city for her sentence; she says she was thrown into jail only for speaking her mind about Ulfric Stormcloak, whom she believes to be a liar and deceiver. This evidently did not go well with the Stormcloak-sympathizing population. When approached, she will show outrage over her imprisonment: "Let me out of here, damn it! I'm not a criminal!" She will then explain how she got here in the first place, saying, "This is what happens to you when you speak your mind in this city." and "They threw me in here because I called Ulfric a liar; a deceiver." She strongly opposes Ulfric and claims that "Ulfric doesn't care about Talos. He yearns for the throne of Skyrim and he'll say anything to rally people to his side." and "But now, because of Ulfric's greed, countless lives have been lost." She will finish with a reflection on her current condition: "On second thought, maybe I'm better off in here. At least I'll die with a clear conscience." If the Imperial Legion controls Riften, she will still remain in prison. This issue has been addressed by version 2.0.0 of the Unofficial Skyrim Patch; she is disabled from the game. It's possible to access Threki's cell, but you must be a vampire. You need to be arrested or open the cell you'd be put in if you were arrested. Wait until Threki is asleep (in the bed closest to your cell), sneak close to the wall where she sleeps, and press the feed option. You'll be transported into her cell to feed, but it's impossible to get out without committing a crime and being arrested again. Esta página foi modificada pela última vez à(s) 11h23min de 14 de setembro de 2014.